E.g.1) Distance = 2, which mean forward -2 and backward +2, total length is 4f. E.g.2) Distance =1, which mean forward -1 and backward +2, total length is 2f. This value will affect the input zoom value (MouseWheel), to scale up/down based on your setting. above is the UpdatePosition() API, parameter “mouseWheel” representing the raw input value, this speed only affect the local preset setting. therefore you can set different across different camera preset. and Zero (== 0) is not allow to move on that direction, therefore setting both forward & backward to Zero (==0), will result in fix position. however we recommend to disable this feature by setting “Distance(+/-)” to Zero. less performance cost for that condition. The major feature for zoom section, to toggle rebound feature. by enable this feature, developer will allow to control the camera behavior: when and how to return it origin distance of orbit camera position. The delay time to trigger rebound action for the camera angle. Each time player start input or calling UpdatePosition() APi, will reset the count down of rebound. after count down finish the rebound process will start. E.g. Rebound Delay = 1.3, is representing after player stop input stream and wait 1.3 seconds, the rebound process will start. How long it will take from current distance to travel back to origin distance, unit on second(s). value := within 0 ~ 1 units. 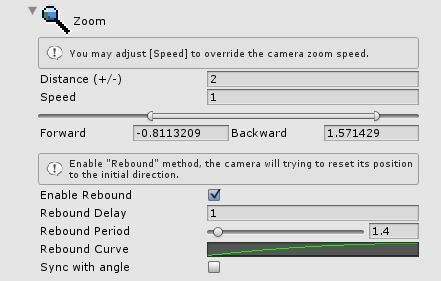 by enable this feature, zoom rebound will wait until “Clamp angle rebound” happen, which mean even zooming delay is Zero or smaller than “Clamp angle delay”, zoom rebound will only happen on player stop changing zoom values AND player stop changing any camera angle AND clamp angle rebound are ready to perform. however the zoom section’s rebound period will not sync with clamp angle rebound period.